COLLECTING FOR KICKS: #200: THE GOALIE PROJECT (Updates P-Z) + C4K Announcements! #200: THE GOALIE PROJECT (Updates P-Z) + C4K Announcements! Months ago I started updating all the goalies in my Goalie Project to get my ongoing list up to date with my current collection. Today I'm finally going to finish that update and get the entire list to par with what's in my binders. Yes I am aware I spelt Schwab wrong on the little paper card on the left but I am human you know! 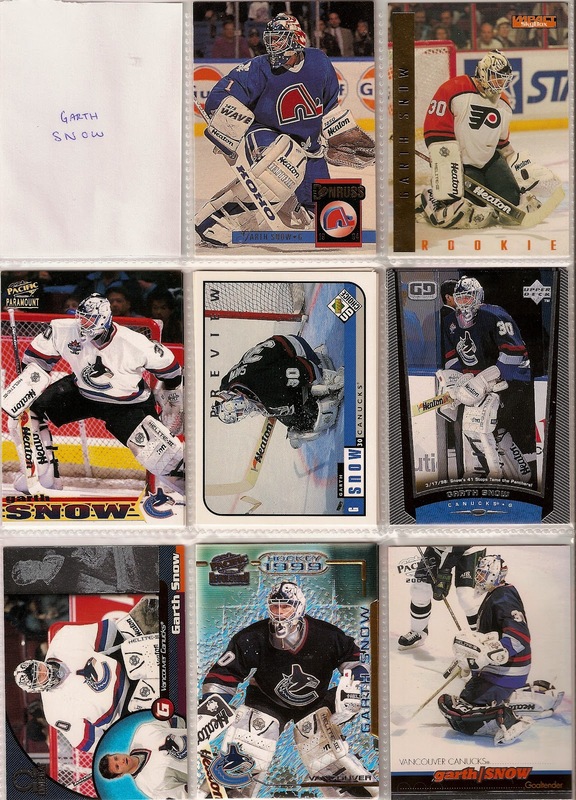 Schwab wasn't a huge time goalie in Vancouver but at least I'm close to completing him with 2/3 of his cards collected (RC in the Devils uni and the card in another teams jersey on the right). "Suitcase" is a different story. 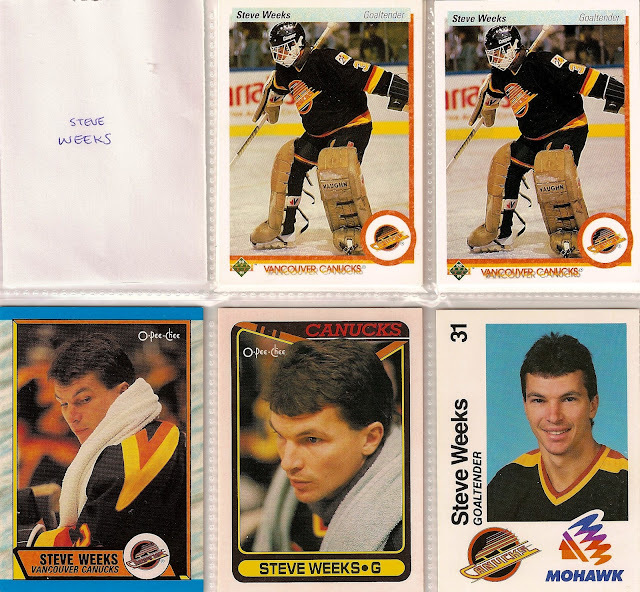 Both of the cards I own of his fall under one lone category and that would be of him in a Canucks jersey. So I still have some digging to do with him. 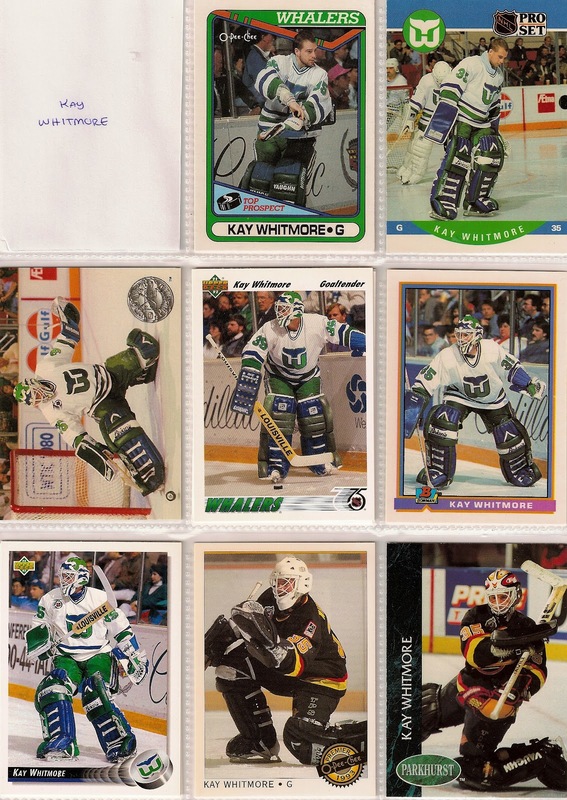 A couple of Snow's rookies are on this page along with a variety of base and parallels of Snow in Canucks gear. I love the different designs the early 2000's had. It's neat looking back at them and comparing them to the sleek and cool designs of today. 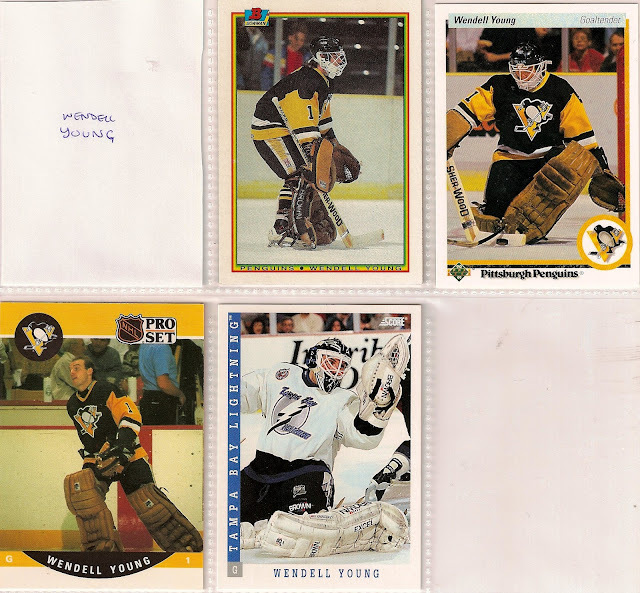 On this second page of Garth Snow are again cards of him with the Canucks but also feature Snow in Pens gear and as well sporting the Islanders colours. That means Snow can be checked off of the list at a perfect 3 for 3! 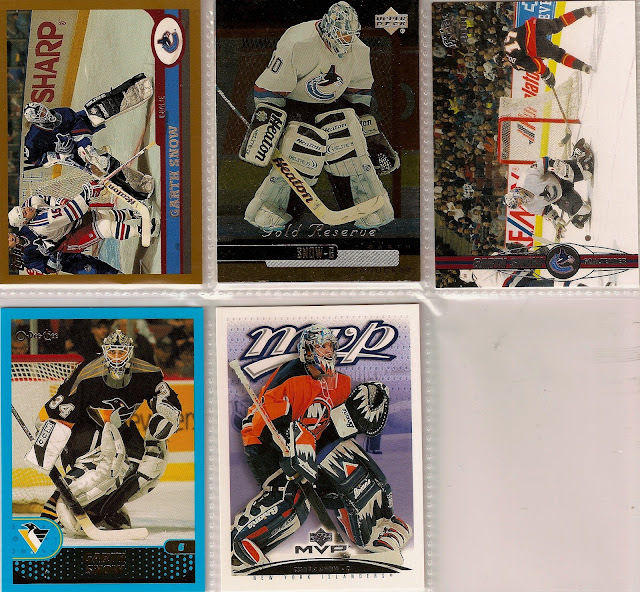 These two pages of Kay show a wide variety of sets from the 90's junk wax era. Your typical stuff like Pinnacle, Donruss, Series 1 etc. Included is a perfect 3/3. Whitmore is in the books! So with these stats I'm about over half way done with the project. I have some older and tougher finds left to dig out but I'm up for the challenge. If you can help with my want list let me know and I'd be glad to work out a trade with you! 1. I have stopped my Cody Hodgson PC. As much as I love the guy and I think he's gonna turn out to be a wicked player, I've made no progress since starting my Cloutier PC. Therefore, I've wiped it off the "to do" list. His cards are at their prime right now and I just don't have the resources to collect him at the moment. 2. I've added "C4K Collection Totals" where the link to C4K Hodgson use to be. That will be an up to date running list of my collection as I valuate it by means of Beckett. Helps keep me organized and you informed on how our collections are growing together. 3. Don't talk about fight club...wait...that's not it...this is Collecting For Kicks 200th post! A few of the cards are going to be tough to find. 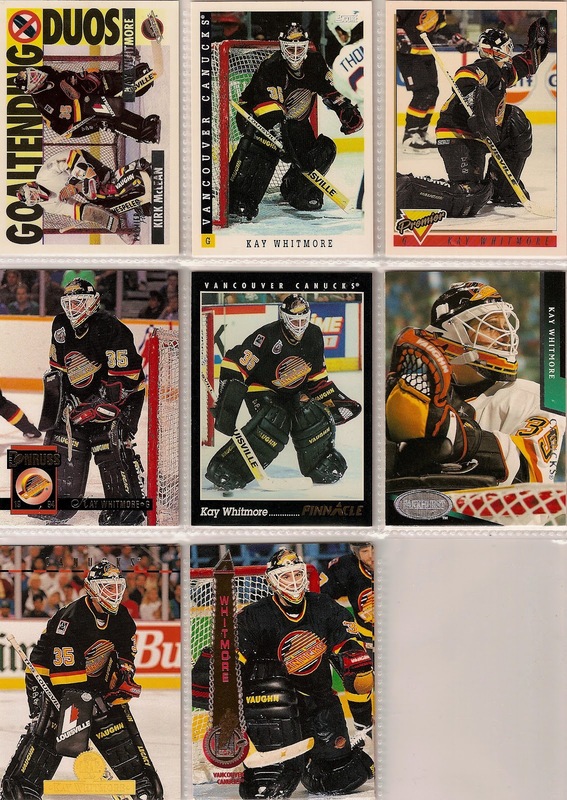 My Canuck project is every RC for every player that's played for the Canucks, so I knew some of these off the top of my head were going to be hard to find. Murray Bannerman only played 20 minutes as a Canuck - unlikely to have a Canuck card. Wow that is super helpful thanks so much for that! What a cool project. I might be able to help you with a few cards. I will have a look through my hockey boxes. Goalie cards are a nice way to collect. Thanks for the kind words guys and right back at you!